History's final chapter will be written in Jerusalem. When an Iranian president thunders amurderous threat or an obscure Turkish drunkard has a dream in Mecca or aJewish couple from Brooklyn lands at Tel Aviv's Ben Gurion airport, theseevents might seem disconnected. But they're not. 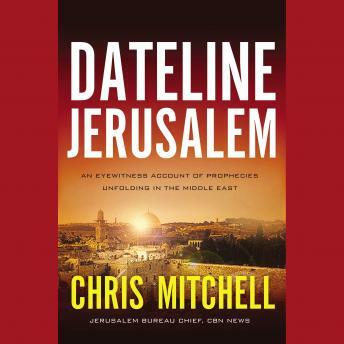 In Dateline Jerusalem,CBN News correspondent Chris Mitchell connects the dots and unveils Jerusalemas the epicenter and crossroads of the spiritual, political, and, yes,supernatural worlds. For thousands of years, Jerusalem's powerfuldraw has always transcended simple economics, military strategy, and religiousaffiliation. In our own time, as the Arab Spring threatensto become an Islamic Winter, one commentator warns: "The Arab Spring doesn'tlead to democracy, it leads to Jerusalem." Indeed, the fragile peace of Israelis in new peril as violent Islamic factions vie for control of surrounding nations.Yet Muslims are converting to Christianity in record numbers. DatelineJerusalem untangles and chronicles all this through the riveting narrativeof a Christian reporter in the upheaval of the modern Fertile Crescent. We live in a world where we cannotafford to be ill informed. What happens in the strategic Middle East, Israel,and Jerusalem is critical. It matters to you. Today's news might focus onWashington, New York, London, or Moscow, but history's final chapter will bewritten in Jerusalem. Chris Mitchell's firsthandexperiences and reporting uniquely qualify him to expound on and explain themajor trends and developments sweeping the Middle East and affecting the world.Mitchell has served as the bureau chief for CBN News since August 2000.